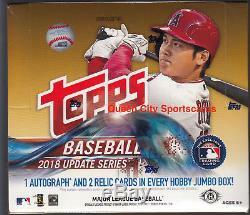 2018 Topps Update Baseball Factory Sealed Jumbo 6 Box Case. PLEASE NOTE THIS LISTING DOES NOT CONTAIN SILVER PACKS. Thank you from Queen City Sportscards. Configuration: 6 boxes per case. Topps Baseball Update Series encapsulates all the best action from the 2018 season and is a must have for every baseball fan! 1 Autograph and 2 Relic Cards per Hobby Jumbo Box. Parallels - Gold Parallel Numbered to 2018. Rainbow Foil Parallel Inserted 1:10 packs. Vintage Stock Parallel Numbered to 99. Independence Day Parallel Numbered to 76. Black Parallel Numbered to 66 HOBBY & HOBBY JUMBO ONLY - Mothers Day Hot Pink Parallel Numbered to 50. Fathers Day Powder Blue Parallel Numbered to 50. - Memorial Day Parallel Numbered to 25. Be on the lookout for Base Card Short Prints, Base Card Super Short Prints and Base Card Short Print Autograph Parallel cards! INSERT CARDS TOPPS SALUTE Salute cards celebrate the performances from superstars throughout the season! - Blue Parallel - Limited. Black Parallel Numbered to 299. Gold Parallel Numbered to 50. Red Parallel Numbered to 10. Celebrating the international makeup of team rosters both past and present. Autograph Parallel Sequentially numbered to 10 or less. Highlighting the final year of legendary players careers. Showcasing the fastest players on two feet the game has ever seen. 1983 TOPPS BASEBALL Celebrating the 35th Anniversary of the 1983 baseball set. Will include rookies, traded stars and established veterans. COMMEMORATIVE RELIC CARDS MLB POSTSEASON LOGO PATCH CARDS NEW! Highlighting the some of the notable players to participate in recent MLB Postseason history. Gold Parallel Numbered to 99. Blue Parallel Numbered to 50. Red Parallel Numbered to 10. Autograph Parallel Sequentially numbered to 10. AUTOGRAPH CARDS TOPPS SALUTE AUTOGRAPHS Rookies Game Changers NEW! - Red Parallel Numbered to 25 or less. 1983 TOPPS BASEBALL AUTOGRAPHS - Black Parallel Numbered to 99 or less. Gold Parallel Numbered to 50 or less. HOBBY & HOBBY JUMBO EXCLUSIVE AUTOGRAPH RELIC CARDS TOPPS REVERENCE AUTOGRAPH PATCH CARDS Numbered to 10. HOBBY & HOBBY JUMBO EXCLUSIVE - Red Parallel Numbered to 5. ALL-STAR STITCHES AUTOGRAPH CARDS Sequentially numbered to 25 or less. Gold Parallel Numbered to 10 or less. ALL-STAR STITCHES DUAL AUTOGRAPH CARDS Sequentially numbered to 25 or less. ALL-STAR AUTOGRAPH JUMBO PATCH CARDS - Gold Parallel Numbered to 10 or less. RELIC CARDS ALL-STAR STITCHES CARDS - Blue Parallel Numbered to 50. Gold Parallel Numbered to 25. ALL-STAR JUMBO PATCH CARDS Numbered to 5 or less. ALL-STAR STITCHES DUAL CARDS Numbered to 25. ALL-STAR STITCHES TRIPLE CARDS Numbered to 25. OWN THE NAME RELIC CARDS Numbered 1/1. HOBBY & HOBBY JUMBO EXCLUSIVE Featuring nameplate letters from a jersey. If you do not receive the per box hits described above, you must directly contact Topps for replacements, as there is nothing I can do once the case has been opened. Please contact me for any additional information or photos. The item "2018 Topps Update Baseball Factory Sealed Jumbo 6 Box Case" is in sale since Saturday, March 16, 2019. This item is in the category "Sports Mem, Cards & Fan Shop\Sports Trading Cards\Baseball Cards". The seller is "qcsportscardsnet" and is located in Charlotte, North Carolina. This item can be shipped to United States, Canada, United Kingdom, Denmark, Romania, Slovakia, Bulgaria, Czech republic, Finland, Hungary, Latvia, Lithuania, Malta, Estonia, Australia, Greece, Portugal, Cyprus, Slovenia, Japan, China, Sweden, South Korea, Indonesia, Taiwan, South africa, Thailand, Belgium, France, Hong Kong, Ireland, Netherlands, Poland, Spain, Italy, Germany, Austria, Bahamas, Israel, Mexico, New Zealand, Singapore, Switzerland, Norway, Saudi arabia, United arab emirates, Qatar, Kuwait, Bahrain, Croatia, Malaysia, Brazil, Chile, Colombia, Costa rica, Panama, Trinidad and tobago, Guatemala, Honduras, Jamaica, Barbados, Bangladesh, Bermuda, Brunei darussalam, Bolivia, Ecuador, Egypt, French guiana, Guernsey, Gibraltar, Guadeloupe, Iceland, Jersey, Jordan, Cambodia, Cayman islands, Liechtenstein, Sri lanka, Luxembourg, Monaco, Macao, Martinique, Maldives, Nicaragua, Oman, Peru, Pakistan, Paraguay, Reunion, Viet nam, Uruguay.